Heating included in the price from October 13th to April 20th. Le Celle stands next to a small church which dates back to the 1500’s. Part of the house also dates back to that period. It is in a hillside position with various places for sitting and eating outside and the pool area with a lovely view. The property is just 2kms from Terontola, 4kms from Camucia and 10kms from Cortona where one can find all shops and supermarkets you might need including petrol stations, chemists and a vast choice of restaurants. We will provide you with details of all the local fiestas and sagras being held during your stay and also a list of all musical and artistic events scheduled in Cortona and the towns nearby. Even Rome and Florence if requested. The owner and caretaker lives in a small, characteristic cottage 30 metres away and is at your disposition for any possible problems or information. At 500 mt. riding horse center. Located in the hills, surrounded by nature and tranquility, culture, good food, nice wine and history, beautiful wiew. Quiet, nature, culture and history, wine and food. Bathroom 1 is very big and has a shower, bidet, wc and hair dryer. Bathroom 2 has a shower, bidet, wc and hair dryer. Two comfortable sofas and bookshelves filled with books in German, English and Italian. Mauro's painted. Gas hobs, electric oven, toaster, blender, kettle. Dinning room with long table , for 10 person, is possible to order breakfast or tuscany lunch-dinner homemade. Notes on accommodation: Central heating in the winter is included in the price from October 20th to April 1st, Wood for fireplace is extra. Outside: The terraced garden has many shaded corners in which to sit. There are 2 pergolas, the main pool is 5 metres x 4 metres with a shower. There is a barbecue, table tennis. The owner can also provide meals on request in a separate building where a selection of local products - olive oil, wine, jams ceramics and painted are on display. Utility Room: Fridge, freezer, dishwasher, washing machine and tumble dryer, iron. Cleaning / Towels / Linen / Maid service: Towels and linen provided. Change of towels and linen after 1 week is an optional extra. Weekly clean an optional extra. Other: Dining room with fireplace, TV/satellite, DVD player. Connection internet. Dear Debbie, Dana and relatives, you have been very kind to write these words, for us you have been special guests, and we would like to see you again in the future, thanks and thanks again, it was a great pleasure to meet all of you. The pictures on the website doesn't give justice to this wonderful place. The house is very beautiful and it's located five minutes from the train station and main road. Mauro and his family are the most loving people you will ever meet. They did everything to make us feel like family. Mauro went above and beyond by assisting us with our needs and recommending the best places to visit. His sister Laura is a wonderful cook and great host. The house accommodations were as describe on the web site if not better. We highly recommend this place. You will not be disappointed. At the end of our 10 day stay we felt that we found new friends. We can not thank Mauro enough for all of his kindness. Thank you for your words, we are happy to have met the families Diaz, you have been the wonderful guests, and we hope to see you again, with you is born a beautiful friendship, thanks again to me and Laura. Beautiful and magical holyday resort. Casa le Celle is truly a magical place. The magic started when we met Mauro at the train-station in Terontola, he guided us up the narrow winding road to the house where we stayed for the next 10 days. The old house was so inviting and charming. Our hosts Mauro and Gala welcomed us with vine and bread on our arrival, they were so good to us and helpful, Gala treated us with delicious cakes on numerous occasion. The house is spacious on two floors, three bedroom on the top floor and one downstairs, the surroundings gave lots of opportunities to lay back and enjoy the amazing nature, sitting areas all around in the beautiful garden, small swimming pool to cool down in the heat and hammock in the shades of the trees. We ordered dinner from our hosts on Saturday evening. They invited my wife and daughter to their house to watch when Laura, Mauro´s sister prepared for the meal and made some homemade Italian pasta. The dinner was very delicious, as was the breakfast they made for us. This is ideal location for families, both for relaxation or sightseeing as well as daytrips to Cortona, Montepulciano, Perugia and other places. On behalf of my family, thank you Mauro and Gala for making our stay so memorable, tell Tiche that the children love her. Casa le Celle gets our highest recommendation. This was a wonderful place to stay for 2 weeks. Mauro made us feel very welcome, he helped us with anything we needed AND he cooked 2 amazing meals for us. There were plenty of places for different members of the family to sit - by the pool, in the shade etc. The views and silence were fantastic. It was a great spot to visit beautiful hill towns and the nearby lake. Some of the group went to Florence and the trip was so easy on the nearby rail line. We enjoyed many great BBQs but also found lovely restaurants nearby too. A lovely retreat and great value. We would highly recommend it. Quite posibly one of the most idyllic holiday destinations we've ever stayed in. This house far exceeded our expectations, warm and spacious with plenty of natural light. The house is split over 2 levels, which we loved as it meant we could spread ourselves out! Plenty of old charm character, but with modern facilities, it was a pleasure to return to the house in the evening after a day of sightseeing. Situated in an ideal location too for all the main towns and cities, Cortona is only a 10 minute drive away and you have excellent supermarkets within the same distance. Mauro, the owner is very friendly, laid back, warm and hospitable. He provided us with firewood and wine and bread on our arrival! If you want a wonderfully spacious, very quiet location, but within easy reach of some of the most beautiful towns and cities then this is definitely the house for you. We absolutely loved it and without doubt would be more than happy to stay there again. Thank you Paul, youwritten beautifull words about us and our property, for me and Gala has been easy because you and family are very kind family, and we hope to see you again future. 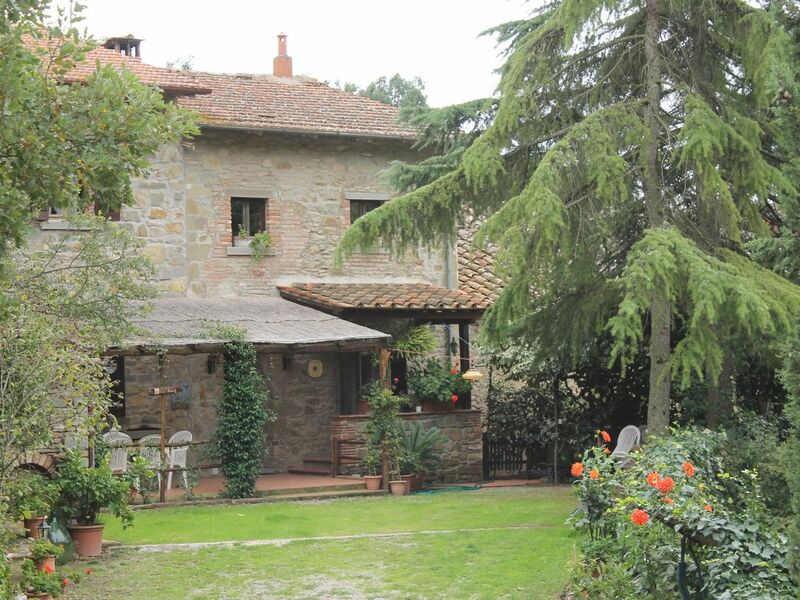 Our family of 5 (all adults/teens) stayed in Gala and Mauro's beautiful Tuscan house for two weeks in July. The house is gorgeous and tastefully decorated. The four bedrooms are spacious and the 2 baths made it easy to accommodate our family. The kitchen is small, but fine and we cooked many meals there. The small pool was perfect for cooling down on the hot days and the pool area a nice place to enjoy a read or play a game of table tennis. There are great hiking possibilities in the mountais with fantastic views of the area, and the nearby Cortona is worth many visits. There are tourists in Cortona, but if you can ignore that, the town has so many treasures - churches, monestaries, medieval and renaissance art, gorgeous views and good restaurants. Easy access to e.g. Siena, Arezzo, Assisi, Firenze, and Montalcino made it a great location for us. Gala and Mauro are the perfect hosts, and were always available and very helpful when we needed them. Mauro met us in nearby Terontola and guided us to the house where we were greeted by Gala who had prepared delicious bruschettas and left us wine and olive oil. This made us feel very welcome. We recommend trying the meal, which is offered by Mauro's sister. She cooks traditional Tuscan meals, and brings it to the house. It was really delicious (and plenty of it) and served with great wine. We would love to come back to this wonderful place, where we were able to wind down, relax, regenerate, and enjoy. Thank you, Mauro and Gala, for a great stay. We are in center Italy, the beaches are in Tirreno see at 1,30 hours and Adriatici see in 2 hours. Terontola railway station, 2kms away, is on the main Rome, Florence, Milan line which makes day trips to some of Italy’s more famous cities very easy: Rome 2 hours, Florence 1 hour. Nearest airports are Perugia 30 mins, Florence 1hr 15 mins, Rome 2 hours, Pisa 2 hours. A car would be necessary. By car Siena is within easy driving distance at 60kms, Perugia 40kms, Assisi 60kms, Arezzo 30kms, Florence 100kms, Rome 200km. Terontola is a well serviced village with all services and shops. Cooked meals, Tuscan cooking courses. Booking Notes: Security deposit 200 euro, pay when arrivi, give back is will all ok when you leave the house Non returnable deposit of 30% at the moment of booking. The number of guest have to be like number written in your request Changeover Day: Changeover day is Saturday. Arrival not before 4pm. Departure before 10 am.